There are two main ‘events’ occuring this year in the garden. The Main Event is an ambitious planting of seeds that I have collected over the years in order to get fresh new seeds for storing and putting into the seed bank for the local savers network I have set up. 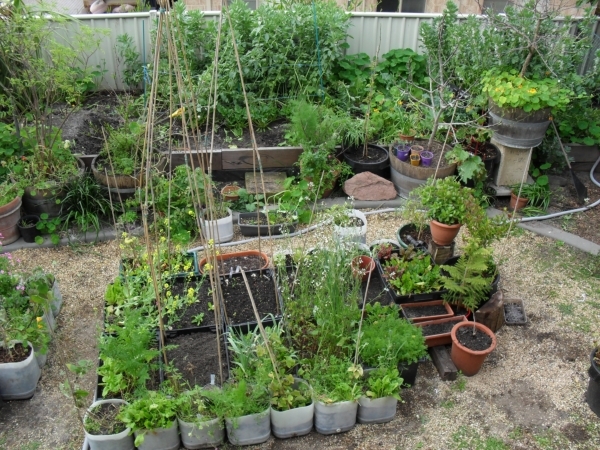 Alongside this I am also wanting to reap a fairly decent harvest for the growing family to feed on – and to maintain this indefinately once the new back garden space comes ‘on-line’ after sitting in a semi-fallow kind of state for the last few months. The other event is a planned open garden in conjunction with one of our neighbours to take place in late November. This has meant acting NOW to get seeds and plants in rather than leaving it a week, or two ….. or three as would normally happen with the distractions of family, work and other projects. Having upped the stakes, it has – as any gardener would know – created some challenges that are having to be overcome fairly quickly, whilst still working with the same constraints as before. ie. limited surface area for growing plants, limited areas of direct sunlight, working in with the other components of the system such as the chickens, guinea pigs and our own inputs such as kitchen waste and recycling. Also, more than previously, TIME has a new value and appreciation. Mainly because it is ‘maxed out’ with the priorities of our new little family member and his changing requirements. This is a post all of its own that I may or may not get to, but probably SHOULD! So, given all these new restraints, goals, objectives and challenges I am dealing with it the one way I see fit – ADAPT. This has meant remaining ever so flexible and looking at things from other perspectives. Dropping some ideas and creating new ones. Looking for ways of having things work and making the advantages sing above the disadvantages. A good example of this is the post below of the consolidation and integration of the chooks and guinea pigs. As I work on the garden I will document some of these things for future reference.